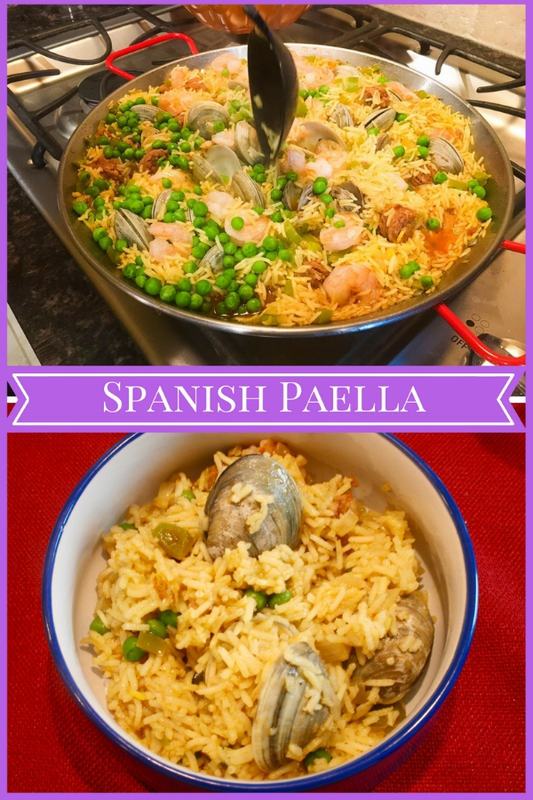 This time, we ventured west of the Italian border, across gorgeous France, and into Spain to make the most famous dish of the culture: Paella! We had originally planned our "at home date night" for this coming Friday, but while buying the live clams I realized those babies weren't going to last 3 days in the fridge so I texted J, "Change of plans! Date night is happening TONIGHT!" I was at my sister's house party planning that afternoon and was concerned that we were going to be cooking this thing until 9 p.m., but it actually took just a little under an hour to prep & cook. Not too shabby! Glad you're back. Technically, they have this recipe as one to make for dinner guests since it makes a whole lot, but since we love leftovers, we made it for us to enjoy for a few days. 1. In a large frying pan or paella pan, warm the oil over medium-high heat. Add the chorizo and cook until browned, turning occasionally. 2. Add the onion, bell pepper, and garlic and sauté until softened, about 3 to 4 minutes. Season with salt and pepper. 3. Add the rice to the pan, along with saffron, and cook for about 2 minutes, stirring until the rice grains are coated. 4. Pour in the broth and add a little more salt. Bring to a boil. Then, reduce to low heat, cover, and cook until the rice has absorbed nearly all the liquid. It should take no more than 20 minutes. Our rice ended up cooking a tad bit faster. We checked it at 15 minutes and it was ready. 5. Press the clams hinge side down into the rice. Spread the shrimp over the rice and top with peas. Cover and cook until the shrimp are opaque and the clams have opened. Our clams took a lot longer than the 5 minutes the recipe said to open up. I think we had ours covered for an additional 10 minutes to get most of the clams open. We eventually had to discard a few since they just weren't having it. 6. Discard any clams that have not opened and serve. We're interested in trying a new country's signature dish. Have one in mind for us? Leave it in the comments below!